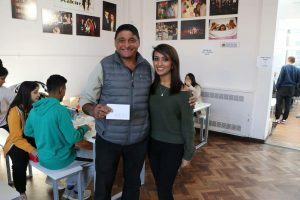 NE Party 2019 | Oshwal Association of the U.K.
On Sunday 20 January, North East Youth Club (NEYC) held a party inviting all ages to join in for some yoga, chokri, board games, activities and lunch. 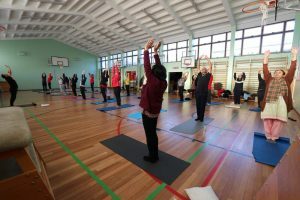 Reteshbhai held a 1-hour yoga workshop for 28 people. 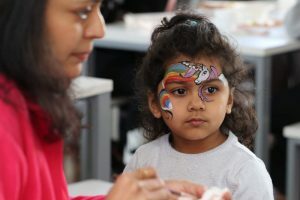 It was great to see such a range of participants, including two young girls with their parents. 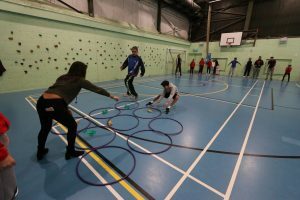 The exercises were designed to cater for all abilities and ages, giving everyone suitable challenges. Reteshbhai did a number of basic breathing exercises, including Bhastrika and Kapalbhati Pranayama. Everyone thoroughly enjoyed the session and feedback was very positive. 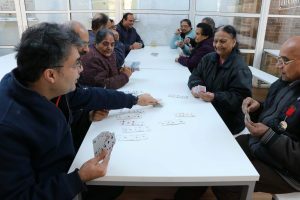 Chokri and board games were also enjoyed by attendees. It was amazing to see so many tables full of Chokri players, who were pleased to see NEYC embracing their generation and enjoying the game. This is the first time we have held Chokri at the club, and we hope to continue it in the future and open Youth Club up to new people. 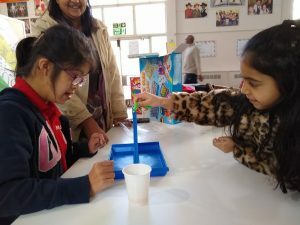 Board games such as carrom, chess, draughts, snakes and ladders and Jenga were brought by NE parents for the day for all to enjoy. 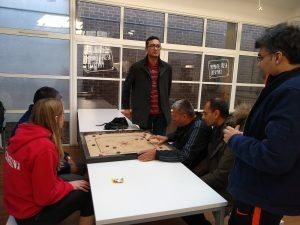 Carrom was a huge hit across both the younger and older groups! It wouldn’t be NEYC without some physical activity! We began with a few rounds of Kho, followed by extreme dodgeball. Everyone loved the sports and the kids and parents were left wanting to play more! 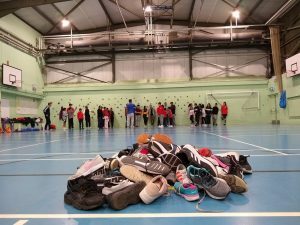 We then moved onto playing a club favourite, the ‘Find Your Shoe’ game. The game involved describing your shoe to the player in front, for them to find it in a pile of shoes. The first team to have all their shoes on their feet and sat down were the winners! Our final game for the day was Tic Tac Toe with hoops. Thank you Mala aunty for bringing the equipment for us! The game worked as usual, except teams had 3 beanbags and had to run one-by-one to place their beanbag in a hoop. These beanbags would then be moved, until a team achieved 3-in-a-row. The game involved speed, hand-eye coordination and tactful play. Combining the three made the game much harder than expected and it was great fun watching players try out different tactics to win. Lunch was served soon after! Kids and adults alike, tucked into a great lunch, consisting of pasta, toasted sandwiches, bhel, fairy cakes, popcorn and drinks, followed by tea and coffee. Thank you Binduben, Hansaben, Pushpaben, Dina, Simi, Hasmita, Caroline, Nayna, Reena, Nishma, Vipa, Sarju and everyone else who helped and took time out to prepare food for the event. 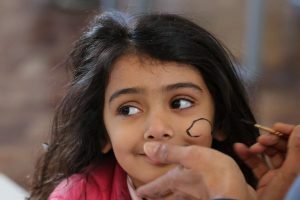 Meanwhile, we had face-painting by Namita and Nishma, and mehndi by Meera. Thank you all for your creativity and putting smiles on the children’s faces. We ended with a speech, in which I thanked all of the NE volunteers for making the day a success. To the parents for bringing games and equipment, Reteshbhai for his amazing yoga session, Namita and Nishma for their vibrant face-painting, Meera for her intricate mehndi, Chimanbhai for organising Chokri, Ajay and Sakshi for taking charge of finances and registration on the day, and the NE ladies for organising a scrumptious lunch for all to enjoy. 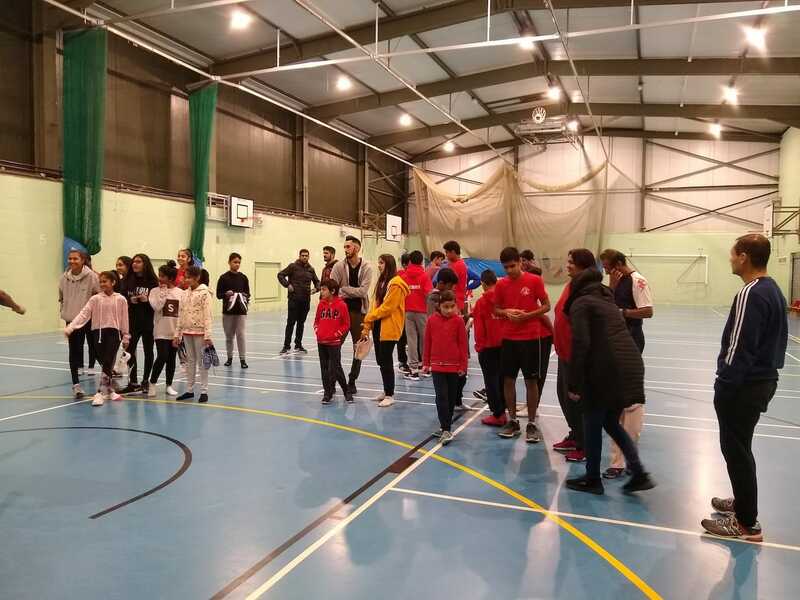 I would also like to thank the NEYC subcommittee – Dhinal, Neeraj and Ketan and Ajay, not only for organising and refereeing games at the party, but also for their commitment week-in week-out and taking charge to improve the youth club. Finally, my biggest thank you goes to Hiteshbhai and Geetaben. Unfortunately, Geetaben could not attend due to illness but sends her regards and gratitude to NE. Thank you to Hiteshbhai for serving NEYC for over 30 years, teaching the kids and growing up with them. Your fun, bubbly personality will be sincerely missed, and I hope we can continue to teach and inspire the kids as you have done over the years. I hope you enjoy your lie-ins on a Sunday morning and embrace your other hobbies such as golfing and tennis, and we wish you luck in the future. The club will forever remain open to Hiteshbhai and Geetaben. Overall, it was a fantastic event and one we hope to repeat annually. Come along to NEYC every Sunday from 09:00 at Alexandra Park School, Rhodes Avenue, N11 2AZ. We offer a free taster session for new joiners and play sports for people of all ages.